I've read a lot of blurbs and reviews on this collection. Most of them say raw, angry, etc. True. Many of the poems are angry. How can one not be angry about the Kent State shootings in 1970? There are several poems surrounding that event, and then some that seem to regard climate change, and even elections. The RESIST part of myself felt very pleased by the examination of these events in such subtle yet telling ways. the wet window glass. I will not see her again. the open hearth's unholy glow on the horizon. we talked of our futures and who would love us. her face melting in watercolor light. Finally, there's the poem River...so exquisite in its simplicity, it's one of the most beautiful poems I've ever read. It all comes back to love. No matter who, or what, you love...love is love. wedged, or sinking in the silt. I recommend this collection to anyone who loves poetry; Poetry that really makes you think. Nancy Richardson’s poems concern coming of age in the rust-belt of Ohio during a period of decay of the physical and political structures that made the region once solid and predictable. Her poems chart the shifting of the foundations upon which a life is built and the unpredictability of events that have profound personal and political consequences, including the shootings at Kent State University. “Without poetry there would be no history,” wrote Paz, and Nancy Richardson superb book is proof enough. 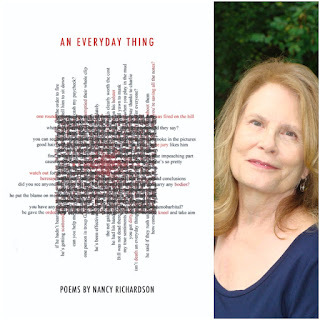 Anchored in the tragic events of Kent State, but radiating out to examine other forms of violence and relationships, Nancy Richardson’s poems speak eloquently and superbly to our own times. To do this she counterpoints the “everyday” whether that be an apt observation or a family event and its unique quality. So for instance, in “Queen Anne’s Lace,” set suddenly in the midst all this, she understands its “Delicacy / in the midst of loss,” but does not stop there, rather moves on to what good poetry should do—heal—as she ends it by noting “these petals of silk, this snowflake of stars,” an image that lets us transcend but not avoid the real world she describes. This is an important book, deftly written, a must read. These terse, understated poems pack a great emotional punch. Unerringly, Nancy Richardson hits the mortal vulnerabilities and the socio-political ones. This book is a history of the grievous wastefulness of a post-WWII United States that in many ways has gone to hell; yet there is no accusation here. Rather, there is the poetry of what has been shattered—be it in a motorcycle accident or voter fraud or the Kent State killings—and cannot be put back together. Nancy Richardson‘s voice is clearly heard through this beautiful and insightful collection. She makes the ordinary extraordinary with her choice of rich images. Nancy Richardson’s poems concern coming of age in the rust-belt of Ohio during a period of decay of the physical and political structures that made the region once solid and predictable. These are poems that chart the shifting of the foundations upon which a life is built and the unpredictability of events that have profound personal and political consequences. 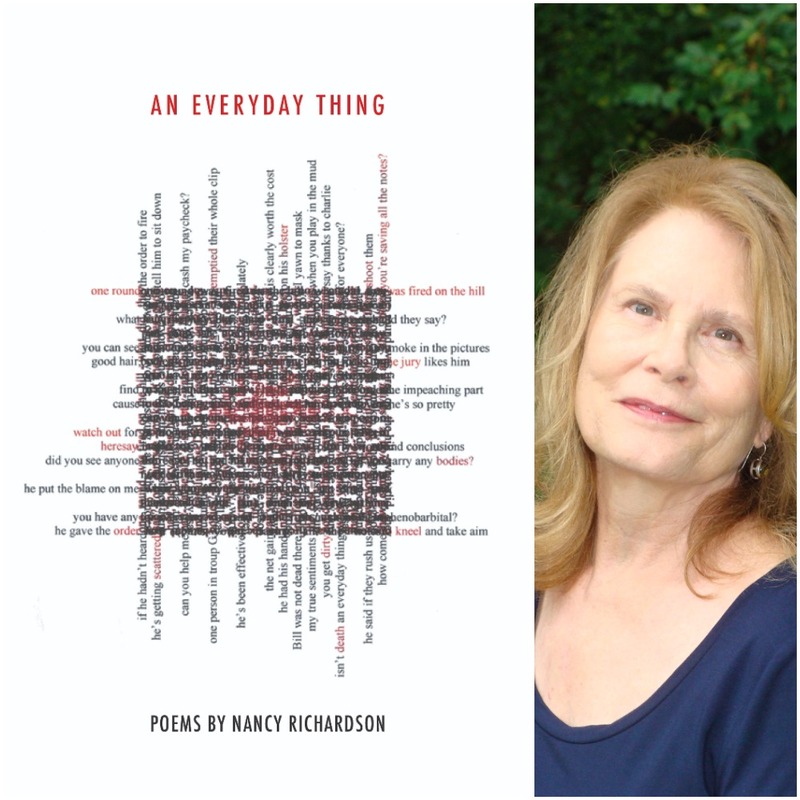 Nancy Richardson’s poems have appeared in journals and anthologies. Her first chapbook, Unwelcomed Guest, was published in 2013 and concerned coming of age in the rust-belt of Ohio and the shootings at Kent State University. The second chapbook, The Fires’ Edge, extended that subject matter in elegies and reflections of living in that place and time. Her latest book, An EveryDay Thing, carries her previous narratives into adulthood with a look back at her history and what that history has created in her. Nancy has an MFA in Writing from Vermont college where she focused on poetry in response to injustice. She has served on the Board of the Frost Place in Franconia, New Hampshire. I don't read a lot of poetry but this one looks really interesting. The two poems you pick out from the volume are not ones I particularly noticed. We read the same volume in different ways. River is sublime--thanks for sharing it. Thanks so much for being on the blog tour for this one. I think even though it has poems about 1970s Kent State shootings, there are echoes of today's madness.